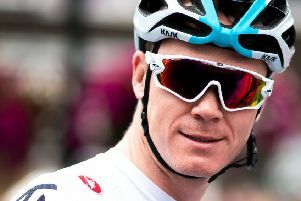 Yorkshire's Olympic cycling superstar Ed Clancy hopes to equal Sir Bradley Wiggins' total of five gold medals. The 31-year-old, Barnsley born and Huddersfield raised, is already the county's most decorated athlete in Olympic history after helping to defend the men's team pursuit title from Beijing and London, picking up his third gold in Rio. After their win, in a video chat with Clancy at Team GB in the Olympic Village - watch it above - he told how he is now thinking four years ahead to what could be his own fairytale ending in Tokyo. There he believes he could end up with two more Olympic golds. That would put him level with Wiggins, aged 36, who ends his career as the most decorated British Olympic athlete with five golds, a silver and two bronzes to surpass fellow cyclist Sir Chris Hoy's tally of six golds and a silver..
Clancy, the only ever present member of the pursuit team to have won gold in the most recent three Olympics, said:: "I'm 31 now and I've got three golds. I'm going to do Tokyo, at least that's the plan. "So who knows, I might pick up another one; two if I'm really lucky. "In reality it's going to be very, very hard to match Sir Brad, but that's nothing to be ashamed of. He's a brilliant guy. He's been a real addition to this team. Brad's retired now but I'm grateful I've gone through two Olympics with him." He paid tribute to National Lottery funding, distributed by UK Sport, which has given the financial support to take him and Team GB up the medals league table. Clancy said: "My whole career started with them really. I was brought in through the talent team - British Cycling it was called back in the day and it's called Go Ride now. Five gold medals for retiring Team GB cycling legend Sir Bradley Wiggins. "Keep buying Lottery tickets. It's not just me that benefits from this.Without the funding, the input we've had from the Lottery and the Government we wouldn't be here." In a stand-out moment of an amazing Games for Team GB they came from behind in the pursuit final to beat the Aussies by almost a second with barely 500m of the 4,000m contest to go. They set a new world record in the heat and broke it once again in the final, with a time of 3:50.265, in Rio's Olympic Park. Clancy was suffering from his own problems, slipping a disc in his back after a training session - simply picking his bag up in the changing room. Surgery followed, forcing him to miss the European championships. He only turned it around in recent weeks, with reports from the team’s training base in Wales that they were going well after smashing the world record in a practice session. A nd he said it felt like the best gold yet. "Yes, I'm over the moon," he said. "It's been a difficult time between London Olympics and getting here in 2016, not just in terms of motivation but getting over injuries and what not. "There is an old sayting, the tougher the fight the sweeter the victory and it's so true. I've never had to work so hard for this one. "I had to get over a back surgery in December and scrape into the team in the World Championships, just to qualify your place. It's been a tough one but crossing that line ahead of the Aussies made it all so worthwhile. "In a typical Team Pursuit the most efficient way to get from A to B is to set off hard, reach a cruising speed which you can only just hang on to, however the problem is if you ride like that in a final the other team can just set off like maniacs, get in your slip stream and then it's very hard to get rid of them. "So both us and the Aussies were well over world record pace for the first two or three kilometers, way over it. There was no schedule really, We went flat out from the gun. I'm guessing they just pushed it a little bit too much, too soon. "That's pursuiting. It's easy to go fast for the first three kilometers. You've got to cross the line after four kilometers. "I guess we just paced it that little bit better than the Aussies and came better in the last two laps. "It's like a house of cards, as soon as you take one guy out of the equation all comes crumbling down eventually. It might take one, two, three laps...but by the time that guy's got to do his turn again, they had nothing to give so it was good for us."